Caledonian Walks: Golf Course Visitors! After damaging the tendons on my right knee a few months ago I was unable to walk properly without a lot of pain. This curtailed my activities and I was not able to do all the things I had planned. Now that my knee is much better I can walk without too much pain, although cycling is still a bit of a problem. One of the first activities I started again was to get in a few rounds of golf. 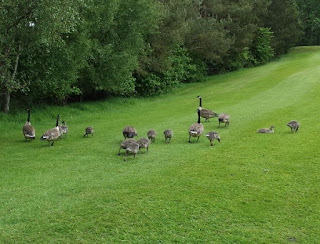 During this time last year one of the fairways often had geese from the local pond pecking away at the grass looking for food. This year was no different. I managed to capture a picture of the birds. The birds seem fairly comfortable with the golfers walking around them and oblivious to the golf balls which come flying towards them from the tee. 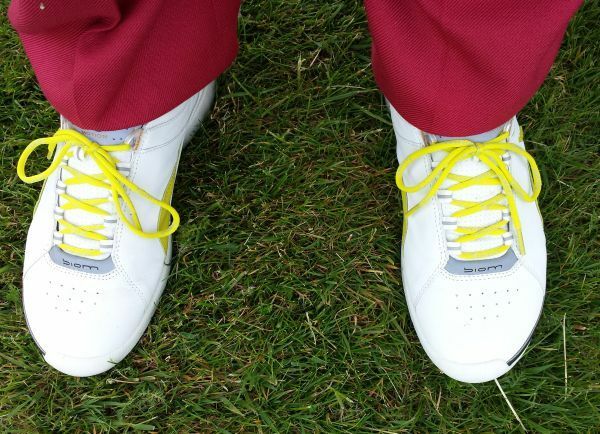 Unfortunately, they do leave little calling cards on the fairway which does create a mess. The course is always in immaculate condition and the green-keepers are always about cutting the grass on the fairways , watering the greens and making the golf course a pleasant place for golfing. On one occasion one of the green-keepers was out on the green cutting the grass with a pair of scissors! The photograph above shows how short the fairway grass has been cut and how the grass has not been allowed to dry out. All we need now is for the rough grass at the sides of the fairway to be cut so that it makes it easier to locate lost golf balls!